1 of 3 Heat oven to 350 degrees F. In a small bowl, stir sugar and cinnamon. 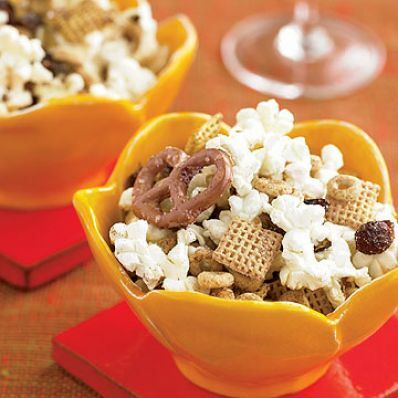 2 of 3 In a large bowl, stir cereals, pretzels, popcorn and cranberries. Drizzle with vegetable oil and hot pepper sauce, then sprinkle with sugar mixture. Stir to coat. 3 of 3 Spread mixture onto a rimmed baking sheet and bake at 350 degrees F for 20 minutes, stirring twice. Allow to cool. Per Serving: 16 g carb., 3 g Fat, total, 95 kcal cal., 1 g pro., 178 mg sodium, 1 g fiber, 0 g sat. fat, 17 mg chol.